Yes, I did try to make that title sound like a soap opera on purpose. 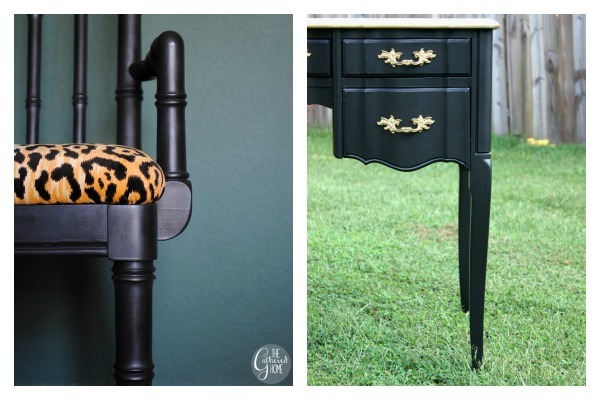 Because these furniture makeovers deserve a title that is just as dramatic as they are. Because they are bold and beautiful. 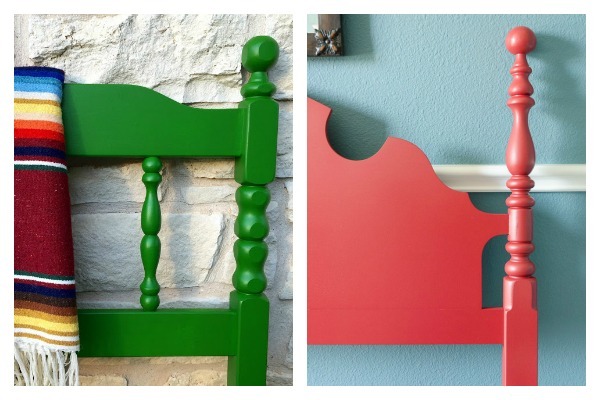 Add a punch of color to your headboard. Of course its no surprise that I would be quite smitten with that kelly green headboard from Jesse Coulter. Adding that hispanic vibe blanket on top is giving me some serious inspiration. And then there’s the red. Red is becoming a new favorite of mine as well. Makely Home knocked it out of the park with that color choice. Both of the headboards’ nooks and crannies were no match for the HomeRight Finish Max! I have no idea how Cuckoo for Design came up with such an amazing color combination for that midcentury modern dresser makeover, but its gorgeous. And while I’m not a huge fan of “little girl pink,” it definitely pairs well with gold hardware and a pop of pattern like the night stand makeover that 11 Magnolia Lane pulled off. When in doubt, black will never fail you. Leopard Print Upholstery and Faux Black Bamboo. I die. 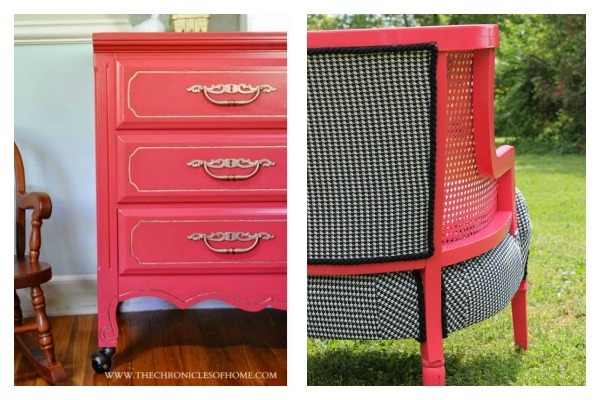 This chair makeover from The Gathered Home has me drooling. Black + Gold will never fail you either. I gave this french country desk a modern, yet still classic makeover with my Finish Max paint sprayer. The Shabby Creek Cottage gave her wood cabinet not only an aqua treatment, but also turned it into a great beverage center. Delicious and DIY gave her coffee table a super fun makeover, topped off with some gold stenciling details. Not only do I love the yellow shade that The Hunted Interior used for her console table, but I also love the fact that she made it – I totally want my own. 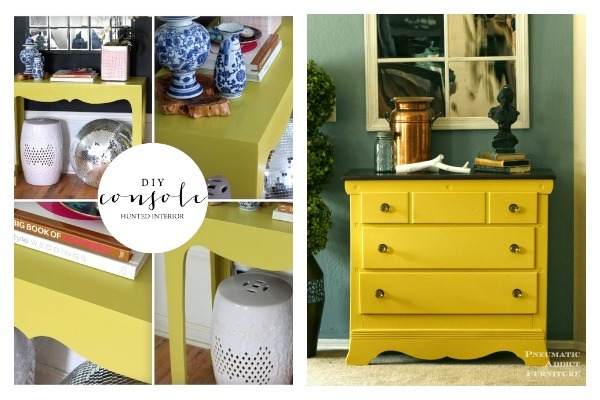 Pneumatic Addict used a Finish Max Pro to complete her black and yellow dresser makeover. A good, bright, coral pink paired with gold never gets old. The Chronicles of Home updated this dresser with the perfect amount of gold detailing. And then there’s my bright pink chair paired with a classic houndstooth upholstery. Honestly, halfway through that makeover, I was a little worried, but I love the contrast in color and pattern. Do you have any furniture that is just begging for a bold and beautiful makeover? 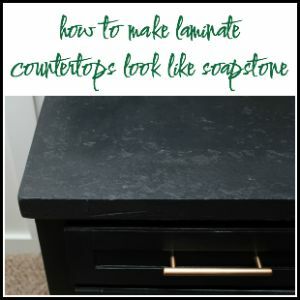 Find more inspiration for furniture makeovers on my Knock-Your-Socks-Off Furniture Makeovers Pinterest board! 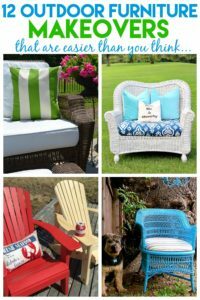 Follow Jenna @ Rain on a Tin Roof’s board Knock-Your-Socks-Off Furniture Makeovers & Hacks on Pinterest. Disclosure: This post was a collaboration with HomeRight. However, all opinions and creating post titles that are soap opera worthy are 100% mine. I wouldn’t go TOO bold 🙂 We just bought our first house and have a TON of projects on our list! I am in the process of redoing my daughter’s bedroom. I want to paint all her furniture pieces different colors of the rainbow. I’d go all out and paint my white living room tables in cobalt and have a design on the top. Lately I’ve been lusting over a variety of shades of blue! 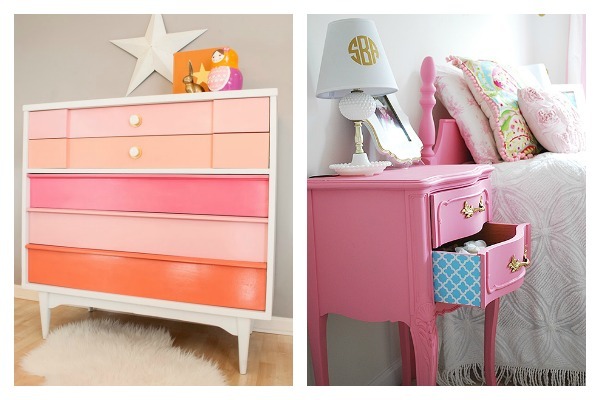 I’d kick it up by painting my guest bedroom dresser with a bright color! I would go really bold with some orange and some green on my patio set! Jenna, I love how your projects turn out using the HomeRight paint sprayer! I have so many pieces of furniture that I need to paint, but I would start with our daughter’s bedroom dresser and nightstands! 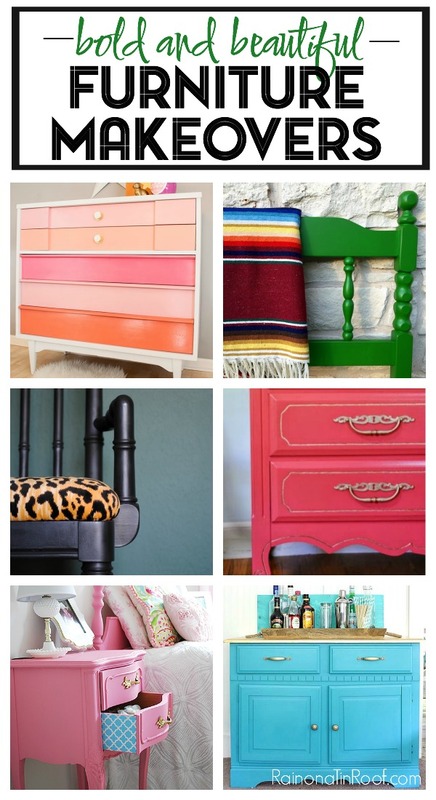 Jenna this is such a fun list, love all the furniture makeovers. 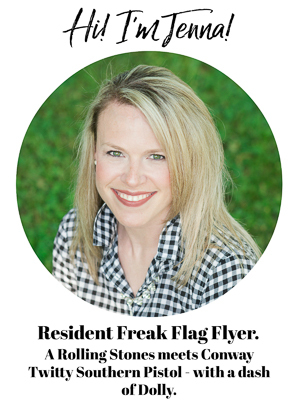 Thank you for including me in the list! Of course, Anam!! Love your table! There are so many things in my house I’d like to use this on! I would love to use this sprayer to paint some cute little chairs for my kids. And my kitchen table needs a makeover badly! 🙂 Thanks for the giveaway! I have a dirty brown color dresser, chest & nightstand with dark brown handles that is crying for a makeover. It is really horrendous looking. I want to paint it a shiny black with new gold handles. I used to have a black bedroom set & I loved it. Now thanks to your fabulous tutorials for makeovers I can have a black set again without having to go in debt for it. Thank you Jenna for the terrific idea! Thank you for the giveaway & the chance to win. God Bless. 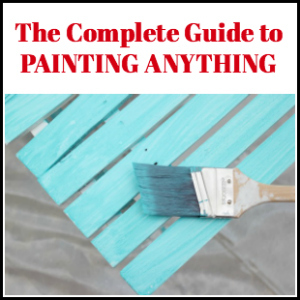 Can you use chalk paint with the Finish Max? You can, Jackie – it just has to be thinned! 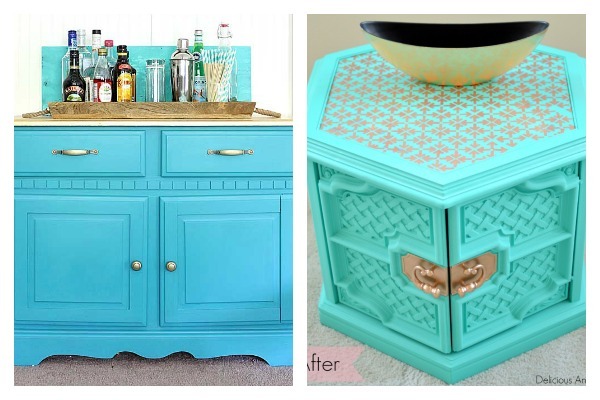 Well now i am inspired to refinish and makeover a couple of pieces that I have around the house!! Loving the BRIGHT colors, gives a whole different look to furniture. All the colors are beautiful. Hard to pick a favorite. I would love to go bold with a great green hue! Super Bold!! Very bright colors for my oldest 2 daughters bedroom furniture!! They have a peace sign and flower theme. I would go with the bold colors……love these colors!! I would LOVE to have a sprayer for all of my goodwill finds. A turquoise would be bold and beautiful! Soooooo many projects to do! I just finished painting my entire interior (to sell my house) now need to redo dressers and chairs and a table and a plant stand…the list goes on! ( for my new house) However, my wrists are killing me from painting so much already! This sprayer seems like a good solution! I would go to town on so many projects, boldly! I would love to paint my dresser. It is boring white, but it is turning yellow in some areas. I also would really like to paint a pair of tall bookcases in my study. And the list goes on…. Jenna you are right, all of these are fantabulous! However when I voted, yours was my vote! But my opinion is they all were gorgeous! But my fave got my vote!! We are planning on painting all our rooms and our furniture. This would be so perfect. First, thank you for the inspiration. I would go bold with blue, orange and some other colors because our master bedroom furniture needs updating. 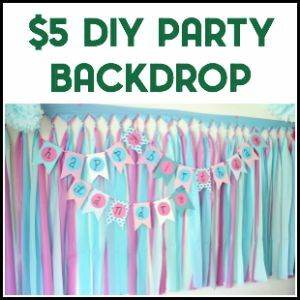 We also need to update our girls playroom with colors (I want it bright and cheerful for them). I would go bold with some yellow furniture for my daughter who is obsessed with yellow! I love the pinks and orange, and yellows. I would totally add some color to my bed set. I like bright blue r coral. It depends on what it is how bold and beautiful I would go but I would definitely go bold and beautiful on some pieces. Some pieces are made to be bold and beautiful. How bold and beautiful would you go with the HomeRight Finish Max Paint Sprayer? I would love to win this Home Right Finish Max Paint Sprayer to paint my rooms. Bold. I’m buying a hutch that fills a whole wall and it will need painting. I’m going either colorful and very dark, depends, after I have it here for a bit. The lady can’t find the key to the glass-front tops, I don’t care I’ll deal with the locks I have a retired locksmith blocks away or I’ll just remove the glass and have open shelves. I mostly bought it for the bottoms, four cabinet/cupboard-size bottoms, three-piece glass tops …. 82″H x 80″ wide for $75. The possibilities are huge. I love the pink and the black projects! Very inspiring. I would love to win the sprayer! Thank you. I would love to redecorate my bedroom with shades of vibrant blues. I am thinking of painting the kitchen stool red! I have so many projects that this could be used for. I have an old china cabinet and several bookshelves that I have been planning on painting. I am SO NOT afraid to go BOLD with color, and I have a garage full of furniture that needs paint makeovers, some for family and some for me…but I NEED that Homeright paint sprayer to git it done, AND to make it BEAUTIFUL!!!!!! I would use this to paint our kitchen cabinets a dark bold color. They are a boring medium colored wood from the 70s and need to be updated badly! I would do a bright pink paint on my daughters night stand by her bedside. I would go bold and beautiful with my found (salvaged) “treasures” that are waiting in the wings (my garage) for their grand entrance. I have been dying to paint a glass display case that I have for my late daughter. I use it to display her photos along with my late mother and some very precious trinkets that they both bought for me before they passed away. She loved Pink with Brown Polka Dots and I just haven’t been able to bring my self to paint it. I think painting it by hand would be much harder than if I had a sprayer. Less time consuming and not as emotional straining for me. I would go very bold! I want to ombre my stairs in shades of turquoise! I can’t get enough of that bright coral color! I’d paint my bookshelf with it and put some spunky black and white wall paper on the backboard. Oooh. I have dressers, chairs and tables that I would paint bright blue and green! I would go bold on my fence! Love, love the bright colors! It would be so fun to paint some furniture like this. It would be beautiful to me just to make a few pieces of my furniture match. I have a regular boring chair that could use a coat of bright yellow paint to add a pop of color in my dining room! I would go bold and paint my new vanity that pretty salmon color I’ve been seeing lately! This paint sprayer is amazing! That would make decorating so much easier! This is fantastic! Just in time for my girls furniture! I have a few bedrooms to paint. I prefer lighter shades, but some bolder colors on a few pieces of furniture would be nice. There are so many rooms and so many things I want to paint —- it would definitely make things more beautiful! I am so in LOVE with all the beautiful paint colors!!!! As a newlywed, in an old house that has TONS of projects, I NEED this sprayer! I don’t believe I would go TOO bold however I do love a deep plumb and/or wine color. Great ideas! This sprayer would really save me time! We would use the sprayer to re-do my sisters home, it really needs help. we would go bold. I don’t know if I would go bold with furniture but the rooms in my house are definitely all bold colors! I’m not a fan of the same old beige blah colors! I’d go very bold, completely color crazy! I several furniture pieces that I would love to paint bright and vibrant to put the wow in a couple of different rooms. I Could use it in a dozen different applications. Thanks for a shot at it! Hope Im lucky! With a new grandson and an artist for a son,the babies room will be unique for sure.thanks so very much for sharing. This would be helpful for so many projects! I would try this on my deck—-blue! I would go full bright and fun orange! I need a little FUN in my house. I would like to repaint my home desk with bright bold colors of yellows and oranges. I’m not terribly adventurous with furniture colors although I have a few smaller pieces that would be great for accents. I’m thinking maroon as an accent for my gray walls. I don’t know how bold I’d go, but I’d love to use this to paint the bricks on the front of my townhouse, then paint the shutters and door for a new look. I love bold and bright colors. My current bedroom color is cobalt blue and my previous kitchen used to sweet pea green (sounds crazy but it looked AWESOME!) My youngest sons bedroom is “crushed paprika” (BRIGHT orange).. we went with a solar system theme! We have so much fun decorating and re-doing stuff around here. Thanks for the chance to win this handy little tool! wow- I would love to win this. I WOULD GO BIG WITH BOLD AND BEAUTIFUL USING MY NEW SPRAYER. I love bold statement pieces! I have got so many features around the house and car that I could use the HomeRight Sprayer on, it would be most helpful. I love decorating with unexpected pops of bold, bright color. I am planning to repaint the dresser in my bedroom a gorgeous dark teal and this sprayer would make the task so much easier than using a brush. I don’t know how bold I’d go, but I’d certainly shoot for beautiful. I’d say maybe a medium to darkish blue with white trim in room with a lot of light is about as far bold as I’d go. I doubt I’ll go too bold. but I hope I can use it for beautiful purposes. I would repaint an old dresser of mine in a bright yellow. I’m seriously looking at my home’s exterior! And I’m sure the spare bedroom furniture would love to be painted too!